I was sent a free copy of this cookbook by Penguin Random House Canada for the purposes of review. All opinions on this post are my own. Thank you to Kim Thuy and Randon House for the recipes I am sharing with you. As a straight cookbook, it’s not as quite strong. If you are familiar with this type of cuisine and you looking for simple, lip-smacking, authentic Vietnamese recipes, this book is a winner. The recipes I tried (five in total) were absolutely delicious, straightforward to make, and got rave reviews from both my teenage sons and my 70-year-old mother. BUT, if I hadn’t first read the book from front to back, and already known quite a bit about Vietnamese cooking, I would likely have been very confused trying to cook some of the recipes. Much like a novel, the cookbook’s arc builds from front to back, with pantry staples and basic recipes, such as Steamed Jasmine Rice and Fish Sauce Dressing coming first, and building through soups, vegetables, grilled and fried food, slow cooking, and desserts, among other things. This is pretty standard for a cookbook; the difference here is that there is no repeated internal guide for cooks who might jump right to the middle, picking a recipe that looks great, as many are likely to do. For example, there are no head notes to any of the recipes. For a cookbook steeped in story, it’s disconcerting to have no mini-story attached to any recipe. I would have loved to know more about the origins of each recipe, how they fit into the Vietnamese culinary canon, and into her fascinating family story in particular. 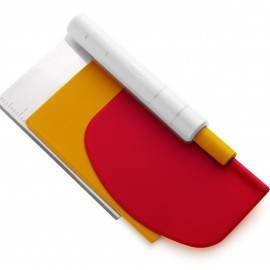 Head notes are also very useful as a navigational guide to the cook using the recipes. A lack can leave big gaps in understanding, especially for someone new to Vietnamese cooking. This was most noticeable in the Fundamentals chapter. The three main pantry sauces give no indication what they might be used for, or which recipes in her book they might enhance. Only as you read through the book do you see the three (Dipping Fish Sauce, Fish Sauce Dressing, and Green Onion Sauce) called for in many of the recipes. The photos in this chapter are great, but there is very little in the way of explanation of ingredients and techniques for someone who wants to build a basic Vietnamese pantry. As frustrating as this was for me initially, once I had read through the (very engaging) book and oriented myself to her style, and settled into the rhythm and beauty of the writing and food, I was drawn in and excited to try as many recipes as I reasonably could. 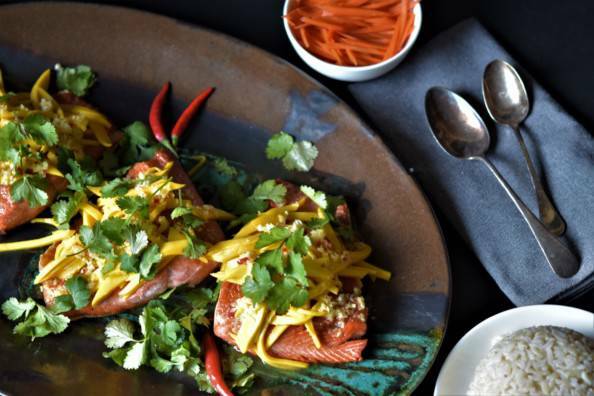 I chose Salmon Steaks with Mango & Ginger Topping, Fish Sauce Dressing, Green Onion Sauce, Vietnamese Pickled Vegetables and Dressed Vermicelli Bowls. Every single one was easy to make, tasted fantastic, and loved by everyone who ate them. My 17-year-old son took seconds of the salmon – I’m sure I was slack-jawed because he looked at me and said “This is the first salmon I have ever had that I have actually liked.” (His dislike of salmon is an ongoing thing in our house). If you are looking for simple and delicious recipes filled with fresh, mouth-tingling Vietnamese flavours, Secrets from My Vietnamese Kitchen definitely fits the bill. 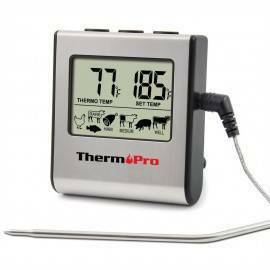 If the fantastic recipes I tried are any indication, you will be thrilled. Just make sure your read it like a novel first, and familiarize yourself with her fundamentals. 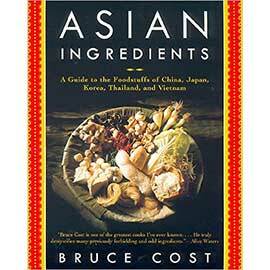 If you have never tried or cooked Vietnamese food before, this book will not hold your hand through the process. Although the recipes are very simple, they provide no preamble or explanation for someone not already familiar with the ingredients and techniques from this part of the world. That said, I am thrilled to add Secrets from My Vietnamese Kitchen to my permanent cookbook collection. 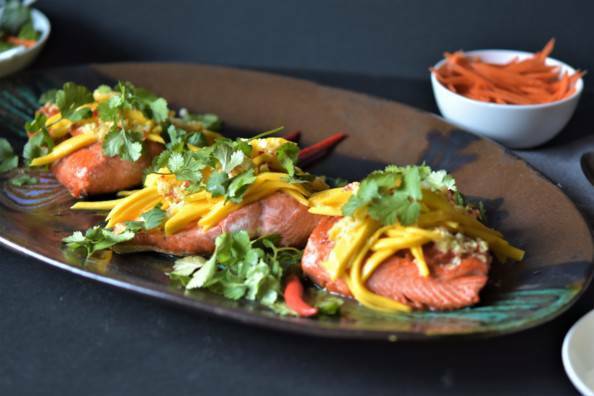 I chose sockeye salmon for this recipe because I thought it would pair well with the strong, bracing flavours in the topping (which it does!). The original recipe calls for salmon steaks; they are not available at this time of year, so I went with large fillets instead and they worked beautifully. I used a mango that was partially ripe, about half to three-quarters of the way there. *Note: her recipe calls for Dipping Fish Sauce, but I used Fish Sauce Dressing, which is almost identical, just more concentrated. I needed it for the vermicelli bowls. The result was so delicious that I am keeping it as is. I’ll give the Dipping Fish Sauce variation in the Dressing recipe, below, if you want to try the original. Topping: In a small bowl, combine the Fish Sauce Dressing (Or Dipping Fish Sauce), the ginger, and garlic. (I also added the minced chili to this mixture, although the original recipe says to sprinkle it on as a garnish). Have the prepared mango ready, but don’t mix it in yet. Salmon: Cover the bottom of a large stainless steel skillet with 1 cm of oil (I used two cast iron pans). Set over medium high heat. Season the salmon with salt and pepper and place in the skillet. Fry for 3 minutes per side (this timing was pretty accurate, even for the thick fillets I bought). Transfer the salmon to a plate covered with two layers of paper towel to absorb excess grease. 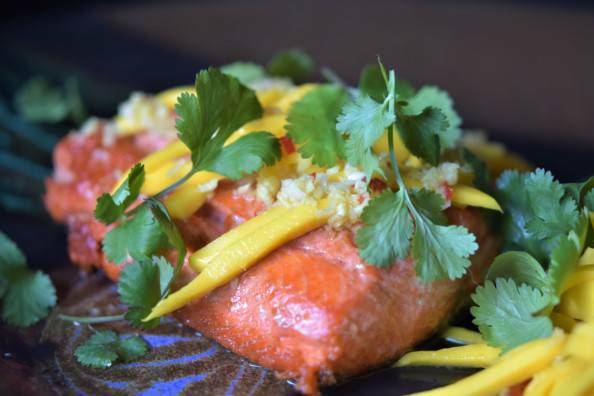 To serve, transfer the salmon steaks to a large serving platter and top with julienned (matchstick cut) mango. 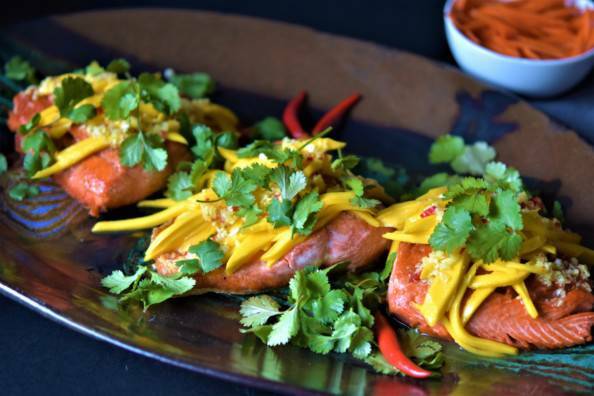 Spoon the ginger mixture over the mango and garnish with cilantro leaves. Serve immediately with jasmine rice. Makes about 1-3/4 cups (430 ml). This sweet, salty, acid sauce is used as the base for many Vietnamese dishes. It last for up to 1 month in the refrigerator. This is the more concentrated version of Fish Dipping Sauce. To make Fish Dipping Sauce, simply make the exact recipe below, but with double the volume of water. Mix all ingredients in a bowl and stir until the sugar is fully dissolved. Store in a mason jar in the fridge. To make Dipping Fish Sauce, increase the water to 250 ml. 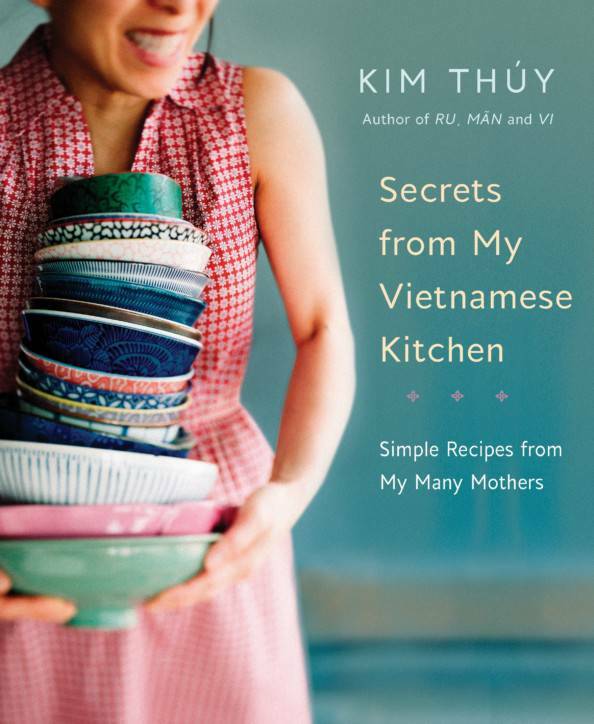 RECIPES Excerpted from Secrets from My Vietnamese Kitchen: Simple Recipes from My Many Mothers by Kim Thuy. Copyright © 2017 Editions Libre Expression. Translated from the French by Sheila Fischman. Recipes translated by Marie Asselin. Appetite by Random House edition published in 2019. Food Photography by Sarah Scott. Published by Appetite by Random House®, a division of Penguin Random House Canada Limited. Reproduced by arrangement with the Publisher. All rights reserved. 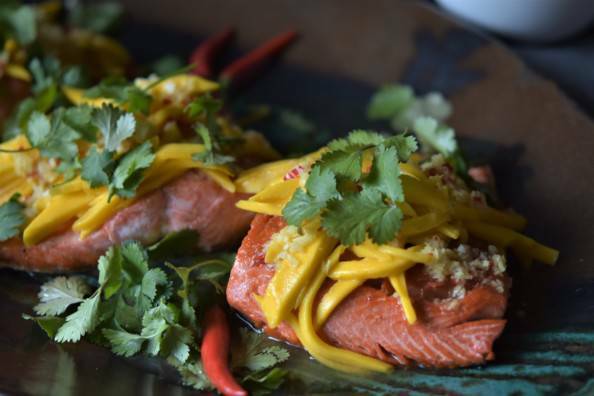 Great Mango and Salmon recipe. For a nice dinner our problem would be getting a ripe mango on the day of the dinner. We buy mangos and eat them on the day the mangoes decide. I love the book review. Hi Bill – since the mango is supposed to be under ripe for this recipe, it might be less of a problem?